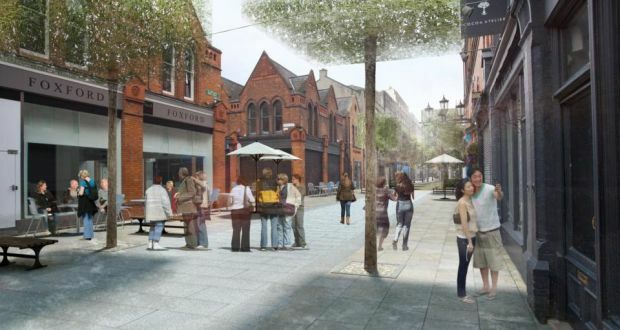 Pictured above is Dublin City Council’s vision for Drury Street in the city centre. Nice, isn’t it? 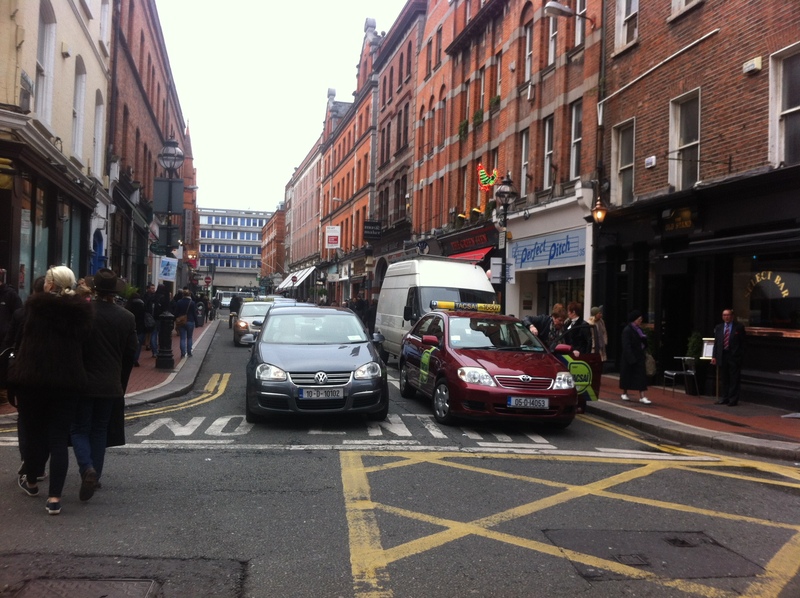 Until you read the document its from, the Grafton Street Quarter Public Realm Plan. Back when it was published we wrote how the plans confirms that Dublin City Council is still living in fear of disrupting the car. While the above artist’s impression image shows what seems to be a people-friendly pedestrian street. None of the notable streets in the quarter will see any motor traffic restrictions. No new pedestrian streets. No bicycle streets planned yet. No contra-flow of any kind. While the centre of South William Street has some paving improvements, made to it years go (pictured above), the street is one of the most important streets in the area yet the conditions are poor for people on foot, in wheelchairs, pushing prams, and on or pushing bicycles. If the council are really planning to remove the on-street car parking as part of the paving plan, why don’t they do it now? Follow New York City’s example with Times Square — make the street changes first and go back a finalise the design and finishings later. What’s stopping them? The street is in a mess, both visually and for access. We sadly expect business as usual. Will anybody be willing to surprise us? 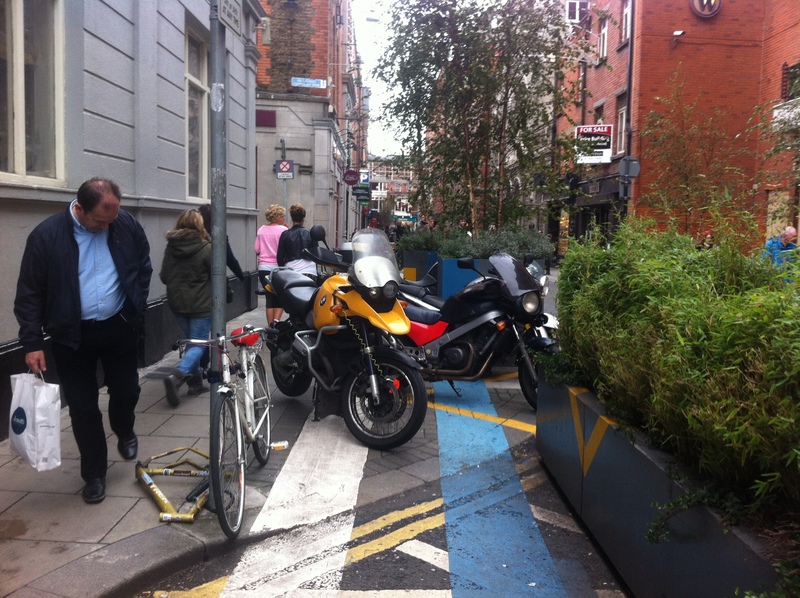 Why is Dublin City so adverse to contra-flow cycling? Why can’t we have wider footpaths before the paving? Why can’t there be access for wheelchairs and prams? Spot on with this piece. All on street parking shoud be removed ASAP, with the exception of strategically placed loading bays and disabled spaces. All car parks on the area shoud be increased to €5 per hour without exception. On top of that whole levels of all car parks should be converted to bicycle with ample room for cargo bikes too. The same needs to happen to the Henry Street area. Why shoud the least efficient transport mode for urban environments get such an unproportionate amount of space ? Dublin needs to see the movement of people over the movement traffic as the priority. Now that you mention it, I’m guessing that the layout of these streets were never altered substantially when they were changed from two-way to one-way. The outrageously narrow footpaths probably date back to when there were lower volumes of traffic that was slower-moving. It’s so very disheartening to see that the council wont take the opportunity to rectify this, let alone even recognise it as a serious problem when redesigning the public realm. Why should these streets and all their users suffer just because BT and the like want their customers to do drive-thru shopping? Nice one Cian. You have very neatly summed up a problem that is replicated across the city and further afield. Unfortunately, those that are spending our hard earned tax euros couldn’t care less about what the public wants or needs. I used to believe that the Councils were well intentioned, but lacked the knowledge how to deliver. Now I believe they really don’t give a damn. The only thing they are interested in is their own agenda and God only knows what that is! These streets are located in that public realm. One issue that I have blogged about this week on my Facebook page is the number of different waste contractors’ HGVs plying to empty wheelie-bins and sacks on these same streets. This is a madcap policy decision that puts both pedestrians and cyclists at enhanced risk of being crushed by a HGV in such narrow spaces. Far too many different waste contractors are servicing this Quarter. One contractor should be given the contract to service such a congested area and the collection period should be set down in the contract! We should be querying what vehicle types should be permitted access to this Quarter. The ‘high-end’ retailers should not be dictating city policy. @Ellen — thanks for the feedback… Always welcomed, especially when positive!